This will be our fourth full day at Lewa and today we’re on to our second outreach clinic. Given our past three days, we were all anticipating a busy day. This is an underserved community and outreach is rarely done here. This is in fact Lewa’s first time at this location so we are not sure what to expect. Wildlife grazing as we make our way to the second outreach at Lewa. Cecilia, the county nurse who is helping with cervical cancer screening, gave a talk to the community before we begin the outreach. She informs them that it will be like a hospital with many services available and they are allowed to use all of them. Cecilia (at centre) giving a talk to the community prior to the start of the outreach. She is informing them of who we are and what services will be available to them. You can see Dr. Aw's back in the right foreground. A meeting of the Medcan Naweza staff to discuss crowd control. There will be over 300 visits today and managing the queues will be a logistical challenge. The first part of the outreach involves a meeting with everyone to determine how we will manage the crowd. By 9 a.m. there were more than one hundred people in line with more arriving every minute. Each of these people will likely see at least 2 doctors and quite probably more. It will be a logistical challenge, but we are also blown away about how many lives we will help with our pop-up clinic. Rose, our "bouncer" for the day. She has made a list of names in the order of each patient's arrival in order to manage the anticipated chaos. We’ve got a tiny Kenyan named Rose who has been designated our "bouncer". Despite her size she is completely in control. Our only issues arise when she occasionally mysteriously disappears and the hall fills with people. It’s a constant battle to manage the crowd. But you can’t blame them. Having medical care, especially western doctors with modern equipment is a rare occurrence and they don’t want to miss the opportunity. The cervical cancer screening team preparing for the day. Dr. Sue and the cervical cancer team performed 50 screenings with 1 abnormal result. Luckily we have the cryotherapy unit and can remove the lesion immediately. 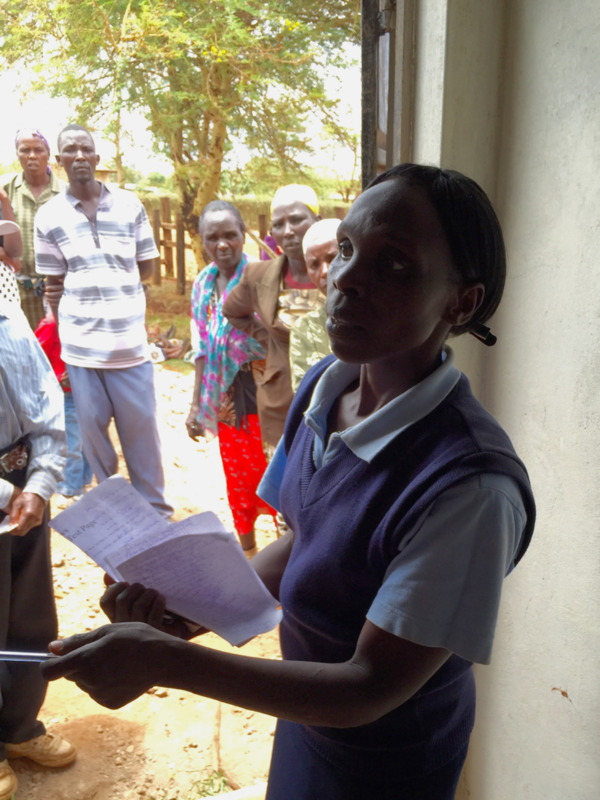 Faith is working with the county nurse Cecelina who is kind enough to help train the Lewa staff under the supervision of Dr. Sue. We are hopeful that the relationship between Lewa and Cecelina will develop so that Lewa will continue the cervical cancer screening outreaches when we leave. Naweza has agreed to sponsor the cost as long as Lewa supplies the labour. They are quite happy with this deal, as are we. With the HPV vaccination too expensive at $300 per person, the next best option is to conduct screening on as many people as possible in order to have early detection. The fact that we have the cryo unit and can remove the lesions immediately has the added insurance that the patient will have a positive outcome. Dr. Michael, Dr. Sue and Dr. James consulting with each other and the Lewa staff to diagnose a patient. Dr. Sue had an interesting case where a woman presented with extremely swollen legs and feet. It was a fantastic moment where she, Dr. Michael and Dr. Aw consulted with each other alongside the Lewa staff to make a diagnosis of heart failure. This transaction was a great example for the staff to see how consulting with each other is a great resource. It is in fact a sign of strength to know when to seek the advice of others and to use all of the resources that you have available. A little patient of Dr. Michael's. What an angelic little face. Dr. Michael is working with John in the pediatrics station. They have many cases and therefore many learning opportunities. With every case Dr. Michael challenges John with questions on how he would treat the patient. It’s basically using real patients and scenarios to create protocols for diagnosis and treatment out in the field. We have found this to be an enormously effective teaching strategy. A man who is suffering from COPD, a chronic lung disease, which causes a wasting away of the body. Very hard to see. Dr. James and Geoffrey are busy seeing chronic disease patients. This one particular patient is suspected of having COPD, chronic lung disease. One of the signs of COPD is a wasting away of the body due to the increased metabolism from the chronic inflammation. Alex had conducted a talk on healthy eating with about 30 people in the community. The group was full of questions from how to reduce uric acid, how much sugar, salt and fat they should eat. Her overall message is to eat less starch and more vegetables and protein. The common food here is either ugali (ground maize made into a paste) or githeri (maize with beans). She found that the meals are frequently comprised of too much starch, made with either potatoes or rice. As well, the people suffer from acid reflux as they usually eat 1 or 2 large meals and simply eat too much too fast. She is providing education on trying to eat less starch, more vegetables and smaller portions. Dr. Sidiqa is working with Ezekiel to conduct eye examinations. She begins with a vision clinic for the school children. Any child who is suspected of requiring glasses is referred to the clinic where they will be examined with the auto-refractor in order to get an exact prescription. We’ve identified a local supplier who will provide the glasses at affordable prices. Naweza will fund the glasses that are as a result of this outreach. Over 350 visits by the patients, fully utilizing all of the services available to them. It’s our last full day at Lewa and we definitely feel like it was the grande finale! The turnout was fantastic and we and the Lewa staff feel like we gave it our all to help this lovely community. Tomorrow we depart Lewa and head to Fluorspar. It will be a busy day of saying goodbye to the Lewa team, then an hour flight to Fluorspar. We are super excited to see the Fluorspar team again and look forward to a productive week together. Day 3 began with a full schedule of reaching out to communities with our partners. Sit down, because this is going to be a long entry! On our way to the outreach in Ntumburi. That's Mount Kenya in the background. We started the day in Ntumburi, a village about 30 minutes from Lewa Clinic. When we arrived, people were already lined up. And patients continued to arrive as the day progressed. Final patient tally: 104. Arriving at Ntumburi. Patients wait in line. They arrived early before the clinic even opened. Dr. Sue worked with Faith and Cecilia, another nurse from a government clinic, who assisted in the cervical cancer screenings. Cervical cancer is a major concern in the developing world and with the vaccine being exorbitantly expensive ($300/patient), we have decided to incorporate training on the next best thing, screening. We’ve been told that a woman who is diagnosed with a small lesion and is told to go to the county hospital to receive treatment simply won’t go. Therefore it’s essential that if we find a minor lesion we must treat it if possible during the same visit. Otherwise the woman runs the risk of having the minor lesion progress into cervical cancer. Dr. Sue and Cecilia, the government nurse, standing next to the cryotherapy unit, which is used to remove minor lesions on the cervix. A cryotherapy unit is used to treat minor abnormalities. We bought one for the clinic prior to our trip but unfortunately it was back ordered and didn’t arrive in time. Luckily we’ve been able to use a second unit from the county hospital for usage during our trip. A clinical officer from the county hospital has also joined us and is able to receive further training on proper screening from Dr. Sue. It will hopefully prove to be a good partnership going forward. Supplies for the cervical cancer screening including homemade cotton swabs and household vinegar. At this particular outreach we did 21 screenings and discovered one abnormality. Dr. Sue and her Kenyan team were able to successfully remove the lesion with the cryo unit. This literally could save this woman’s life by having early detection with immediate treatment. Dr. James worked with Geoffrey at the general medicine/chronic disease station. The conditions that were presented included potential kidney stones, metabolic syndrome (pre-diabetes) and diabetes. One of our observations is that as we are beginning to screen for chronic disease, the drug formulary (an official list giving details of medicines that may be prescribed) will need to change accordingly. Many times we found that the drugs that were brought from the Lewa pharmacy were inadequate for treating chronic disease illnesses. Our recommendations will include a model formulary and proper stock levels to ensure drugs are available at the time of need. Dr. James and Geoffrey seeing a patient at the outreach clinic. Emily, our new community health worker was here collecting data on chronic disease patients. Using her smartphone, she was able to digitally collect data on 70 patients. Community Health Worker Emily records the blood pressure of a patient at the outreach clinic. The high-risk patients (see photo below) were instructed to go see Dr. James and Geoffrey, who will begin a treatment plan that will be a combination of nutritional and lifestyle counseling and medication depending on their individual score. This was an excellent start to the program. Emily has kindly agreed to join us again on Wednesday when we open our second outreach clinic. An alarming blood pressure taken at the outreach clinic. A normal score is around 120 over 80. This patient had no idea and felt relatively fine. The issue with chronic disease is that it is asymptomatic - so people don't know they are at risk of stroke, diabetes or other cardiac event. Through the screening program, this patient will receive treatment before such an outcome occurs. Preventive health at its best. Dr. Michael worked with Lydia in the pediatrics area. A few cases involved children complaining of red/itchy eyes. A little boy whose eyes are suffering from the smoke effects of having an open wood fire used for cooking in the house. The likely cause after taking a history of the patients was that the red eyes are due to smoke in the house as it is quite common in this region to use an open wood fire when cooking. Many times the only exit for the smoke is the window that the fire is positioned next to resulting in eye irritations in the family. Dr. Michael seeing patients at the outreach clinic. The only treatment is education on proper ventilation. Unfortunately easier said than done when trying to change behaviour that is so embedded in the culture as well as limited resources. While some of the Medcan Naweza crew were seeing patients at Ntumburi, Dr. Sidiqa and Alex were at a school to conduct vision screenings, teach health literacy sessions and perform nutritional assessments. Dr. Sidiqa and Ezekiel worked until dark to examine patients. Rather difficult to do vision screening when only using a flashlight, but it would be worse to turn them away after waiting hours (all day for some) to be seen by the doctor. Dr. Sidiqa had the opportunity to work with Ezekiel to continue training on general eye health explaining the difference between various eye infections. As well, she trained him to use eye charts so that they are able to determine if the child needs to come to the clinic for a full examination. Today the team screened 50 children. Ten kids likely require glasses. They’ll come to the clinic tomorrow to be examined using the auto-refractor and trial lens kit to determine their prescriptions for eyeglasses of which Naweza will provide. Dr. Sidiqa also educated the children on proper hydration and its importance for healthy eyes, especially in this very dusty environment. She gave them water bottles and had each of them write their name on the bottle. She instructed that each must refill the bottle at the school tap at least once during the day to ensure proper hydration. Alex providing dietary advice to a patient. This consult was virtually done in the dark with the only light provided was from my camera flash. Alex had the opportunity to meet with the children and hear what they eat in typical day. The school actually had its own garden! The kids all have a role in maintaining the garden, which supplies the lunches for both the children and teachers. For lunch at the school that day was maize and beans with no greens. In comparison, interestingly, the teachers' bowls all contained greens. She also had a chance to visit a market and see first hand what the Kenyans are buying and the cost of the food. A sweet moment when this little boy, who had befriended Alex, jumped in the jeep with us when we were leaving. His mom eventually got him out of the jeep with the help of a lollipop we gave him. Tomorrow will be another day of capacity building and training at the clinic. We’ll also have a chance to see patients who are more complex in nature. These patients are the ones we review on our bi-weekly call with the clinic when we are in Toronto, so the doctors are most eager to see them face to face. That’s it for now! Thanks for reading. Be sure to check us out on Instagram and Facebook for more photos from the day. Team Naweza arrived in Kenya on October 2 but we've had trouble connecting with wifi. First stop, Lewa Downs, one of our two sister clinics in western Kenya. This is our fifth medical trip to Kenya and we’ve got an incredible list of health professionals with us. The team consists of: Dr. Michael Hawkes to focus on pediatrics; Dr. James Aw, chief medical officer at Medcan who will lead chronic disease projects; Optometrist Dr. Sidiqa Rajani to lead eye health efforts; Gynecologist Dr. Sue Wong to focus on women's health and obstetrics; Registered Dietitian Alex Friel to focus on nutrition projects; and myself, as the team lead to make sure we make the most of our days here. (Left to right) Ezekiel, the head of the Lewa Clinic greets Dr. Michael Hawkes, Stacy Francis, Dr. Sidiqa Rajani, Alex Friel and Dr. James Aw. To bring you up to date since our trip last April, Lewa recently had theft issues within its clinic pharmacy and were forced to let go of its entire clinical staff. Devastating for us to say the very least as our program is centered around medical training, education, and capacity building. With the former staff, so went all our training. However, we have a partnership with Lewa, and as a true partner, we experience the highs and the lows of any new project. We decided that as long as we had confidence in the new staff, we would continue the relationship. This past July, I brought a group of doctors here to assess whether we should proceed. I’m happy to say, after that visit we felt very optimistic that the new employees were going to be good partners. They were motivated and receptive to all that we had to share and we felt hopeful that a long relationship was likely achievable. So … fast forward 3 months … and here we are. Ready to begin our fifth mission with a fantastic group of Canadian doctors who are ready to continue the work of providing training and expertise to this special clinic at Lewa Downs. Continue developing the chronic disease program, our main focus of this initiative. Provide training on pediatric issues, namely neonatal resuscitation and pneumonia. Cervical cancer screening and training on first level of treatment. Training on visual acuity including usage of an auto-refractor, which we’ve donated to the clinic. This equipment enables the optometrist to measure eyeglass prescriptions. Provide nutritional counselling training as it pertains to chronic disease, maternal health and malnutrition in children. After travelling from Nairobi and having lunch at our lodge, we went to the clinic to meet the staff. Even on a Saturday, 10 employees were present with all hands were on deck. We reviewed the itinerary for the week, heard their feedback and have come to a mutually agreed upon final draft of the week. All of course with the caveat that we are most willing to change and amend the schedule at any point if they feel they need more of “this” or less of “that”. We are only here for 4 full days. Our time is limited and we want to make sure we’re using it in a way that best provides training and strategies that will best enable them to operate at a higher level when we are not here. That’s the goal. Registered Dietitian Alex Friel speaks to clinic staff at Lewa Downs. We ended the afternoon session with a talk by Alex, our registered dietitian, who explained how she would support the doctors throughout the week with nutrition strategies for prevention and treatment of disease and other conditions. They were quite engaged and full of questions as they thought of their patients and how nutrition could play a valuable role in the treatment strategies they were using. One of the white rhinos we spotted on our way back to the lodge. A rare and spectacular sighting. While heading back to the lodge, our driver was kind enough to do a mini game drive. For whatever reason the elephants and giraffes were no where to be seen. However (! ), we saw two rhinos in two different locations. One with its baby! Rare to say the least. A real treat and a great way to end our first day. We’ll begin tomorrow morning at 9 a.m. with a full schedule. Be sure to check back for a full report. And please, don’t forget to check out photos on Instagram, Facebook and Twitter.